What is make-up? 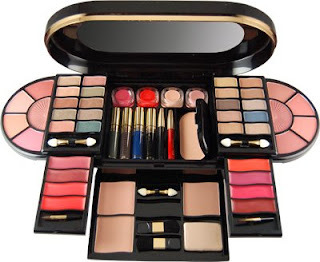 It is subset of cosmetics which refers primarily to coloured products intended to alter the user’s appearance. Make-up enhances your personal appearance. When you put your best face forward, your self-confidence and self esteem are enhanced. When you feel like you look better on the outside then you will feel better on the inside. Putting on make-up makes you feel better about yourself, because when you look good, you FEEL good! Below are the basic things you need to know about make-up. Eye Primer: Used to prolong the wear of eye shadows on the eye as well as intensify colour payoff from shadows. Lipgloss: is a sheer form of lipstick that is in a liquid form. Lipstick, lip gloss, lip liner, lip plumper, lip balm, lip conditioner, lip primer, and lip boosters: Lip stains have a water or gel base and may contain alcohol to help the product stay on the lips. The idea behind lip stains is to temporarily saturate the lips with a dye, rather than covering them with a coloured wax. Usually designed to be waterproof, the product may come with an applicator brush or be applied with a finger. Concealer: makeup used to cover any imperfections of the skin. Concealer is often used for any extra coverage needed to cover blemishes, or any other marks. Concealer is often thicker and more solid than foundation, and provides longer lasting, and more detailed coverage. Some formulations are meant only for the eye or only for the face. Foundation: used to smooth out the face and cover spots or uneven skin coloration. Usually a liquid, cream, or powder, as well as most recently, a light and fluffy mousse, which provides excellent coverage as well. Foundation primer can be applied before or after to get a smoother finish. Some primers come in powder or liquid form to be applied before foundation as a base, while other primers come as a spray to be applied after you are finished to help make-up last longer. Face powder: used to set the foundation, giving a matte finish, and also to conceal small flaws or blemishes. Rouge, blush or blusher cheek colouring: used to bring out the colour in the cheeks and make the cheekbones appear more defined. This comes in powder, cream, and liquid forms. Contour powder/creams: used to define the face. It can be used to give the illusion of a slimmer face or to even modify a person’s face shape as desired. Usually a few shades darker than one’s own skin tone and matte in finish to create the illusion of depth. A darker toned foundation/concealer can be used instead to contour to create a more natural look. Highlight: used to draw attention to the high points of the face as well as to add glow to the face. It comes in liquid, cream, and powder form. Often contains shimmer, but sometimes does not. A lighter toned foundation/concealer can be used instead to highlight create a more natural look. Bronzer: used to give skin a bit of colour by adding a golden or bronze glow. Can come in either matte, semi matte/satin, or shimmer finishes. Mascara is used to darken, lengthen, and thicken the eyelashes. It is available in natural colours such as brown and black, but also comes in bolder colours such as blue, pink, or purple. There are many different formulas, including waterproof for those prone to allergies or sudden tears. Often used after an eyelash curler and mascara primer. There are now also many mascaras with certain components to help lashes to grow longer and thicker. There are specific minerals and proteins that are combined with the mascara that can benefit, as well as beautify. Eyeliner: used to enhance and elongate the size of the eye. · Makeup remover: is the product used to remove the makeup products applied on the skin. It is used for cleaning the skin for other procedures, like applying any type of lotion at evening before the person go to sleep.